No. The Excise Act of Canada Section Chapter E14 Section 130(1) and (2) provide for the issuance of a license, with a required bond, to distill spirits. 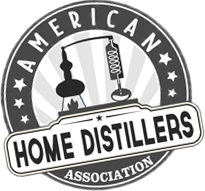 In addition, Excise Act of Canada Section Chapter E14 Section 3.1 says that ““still” means any distilling apparatus whatever adapted or adaptable to the distillation of spirits”. Therefore any still is prohibited because it could be adaptable to distillation of spirits, even if it has not actually been so adapted. What is charge (felony, misdemeanor, etc.) The penalty statutes do not indicate whether it is considered a felony or misdemeanor, however, the length of the maximum jail term would indicate that it is a misdemeanor. What is maximum fine? The Excise Act of Canada Section Chapter E14 Section 158(1) provides that “1) Every person who, without having a license under this Act then in force, (a) distils or rectifies any spirits, or makes or ferments any beer, wash or wort, (b) assists in distilling or rectifying any spirits, or in making or fermenting any beer, wash or wort, in any unlicensed place, (c) imports, makes, commences to make, sells, offers for sale or delivers any still, worm, rectifying or other apparatus suitable for the manufacture of spirits or for the rectification of spirits, or any part of the apparatus, (d) completely or partially sets up or assists in setting up, prepares or partially prepares for working, any such still, worm, rectifying or other apparatus, (e) has in his possession, in any place, any such still, worm, rectifying or other apparatus, or any part or parts thereof, or any beer, wash or wort suitable for the manufacture of spirits, except in cases of duly registered chemical stills as provided for in this Act, or in whose place or on whose premises those things are found, (f) conceals or keeps, or allows or suffers to be concealed, or kept, in any place or premises owned or controlled by him, any such still, worm, rectifying or other apparatus, or part thereof, or any beer, wash or wort suitable for the manufacture of spirits, or (g) conceals by removing, or removes, or assists in concealing by removing or otherwise, any such still, worm, rectifying or other apparatus, or part thereof, or any beer, wash or wort suitable for the manufacture of spirits, is guilty of an indictable offence and liable to (h) a fine of not more than ten thousand dollars and not less than five hundred dollars, (i) imprisonment for a term not exceeding twelve months, or (j) both fine and imprisonment”. In addition, Section R.S.O. 1990, c. L.19, Section 61(3) provides that “Upon conviction for an offence under this Act, other than a contravention of subsection 30 (1), (2), (3), (4) or (4.1), (a) a corporation is liable to a fine of not more than $250,000; and (b) an individual is liable to a fine of not more than $100,000 or to imprisonment for a term of not more than one year or both”. What is maximum fine? Section R.S.O. 1990, c. L.19, Section 61(3) provides that “Upon conviction for an offence under this Act, other than a contravention of subsection 30 (1), (2), (3), (4) or (4.1), (a) a corporation is liable to a fine of not more than $250,000; and (b) an individual is liable to a fine of not more than $100,000 or to imprisonment for a term of not more than one year or both”. In addition, Section R.S.O. 1990, c. L.19, Section 61(3) provides that “Upon conviction for an offence under this Act, other than a contravention of subsection 30 (1), (2), (3), (4) or (4.1), (a) a corporation is liable to a fine of not more than $250,000; and (b) an individual is liable to a fine of not more than $100,000 or to imprisonment for a term of not more than one year or both”. Can still be seized? Yes. The Excise Act of Canada Section Chapter E14 Section 158(2) provides that “All stills, worms, fermenting-tuns, rectifying or other apparatus suitable for the manufacture of spirits, or for the rectification of spirits, or parts thereof, and all beer, wash, wort or spirits that are found in the possession of any unlicensed person, or in any unlicensed place, shall be forfeited to the Crown, and shall be seized by any officer, and may either be destroyed when and where found or removed to a place of safe-keeping in the discretion of the seizing officer”. In addition, Section R.S.O. 1990, c. L.19, Section 47(1) provides that “A police officer may seize any thing, including liquor, if, (a) he or she reasonably believes that the thing will afford evidence of an offence under this Act; (b) he or she reasonably believes that, (i) the thing was used or is being used in connection with the commission of an offence under this Act, and (ii) unless the thing is seized it is likely that it would continue to be used or would be used again in the commission of an offence under this Act…”. Can additional property be seized? Yes. R.S.O. 1990, c. L.19, Section 46 provides that “Liquor kept for sale or offered for sale in contravention of subsection 5 (1) and liquor purchased in contravention of section 27 is forfeited to the Crown”. In addition, Section R.S.O. 1990, c. L.19, Section 47(1) provides that “A police officer may seize any thing, including liquor, if, (a) he or she reasonably believes that the thing will afford evidence of an offence under this Act; (b) he or she reasonably believes that, (i) the thing was used or is being used in connection with the commission of an offence under this Act, and (ii) unless the thing is seized it is likely that it would continue to be used or would be used again in the commission of an offence under this Act…”. What is maximum fine? Section R.S.O. 1990, c. L.19, Section 61(3) provides that “Upon conviction for an offence under this Act, other than a contravention of subsection 30 (1), (2), (3), (4) or (4.1), (a) a corporation is liable to a fine of not more than $250,000; and (b) an individual is liable to a fine of not more than $100,000 or to imprisonment for a term of not more than one year or both”. Can property be seized? Yes. The Excise Act of Canada Section Chapter E14 Section 158(2) provides that “All stills, worms, fermenting-tuns, rectifying or other apparatus suitable for the manufacture of spirits, or for the rectification of spirits, or parts thereof, and all beer, wash, wort or spirits that are found in the possession of any unlicensed person, or in any unlicensed place, shall be forfeited to the Crown, and shall be seized by any officer, and may either be destroyed when and where found or removed to a place of safe-keeping in the discretion of the seizing officer”. In addition, R.S.O. 1990, c. L.19, Section 46 provides that “Liquor kept for sale or offered for sale in contravention of subsection 5 (1) and liquor purchased in contravention of section 27 is forfeited to the Crown”. In addition, Section R.S.O. 1990, c. L.19, Section 47(1) provides that “A police officer may seize any thing, including liquor, if, (a) he or she reasonably believes that the thing will afford evidence of an offence under this Act; (b) he or she reasonably believes that, (i) the thing was used or is being used in connection with the commission of an offence under this Act, and (ii) unless the thing is seized it is likely that it would continue to be used or would be used again in the commission of an offence under this Act…”. What is maximum jail time? See above. Can additional property be seized? See above. No. Revised Statues of Ontario, (R.S.O.) Chapter L19, Ontario Liquor License Act Section 5(1) provides that “No person shall keep for sale, offer for sale or sell liquor except under the authority of a license or permit to sell liquor or under the authority of a manufacturer’s license”. What is the penalty for possessing / and or selling illegally produced spirits without a permit? What is charge (felony, misdemeanor, etc.)? The penalty statute does not indicate whether it is considered a felony or misdemeanor, however, the length of the maximum jail term would indicate that it is a misdemeanor. Yes. The Excise Act of Canada Section Chapter E14 Section 130(1) and (2) provide for the issuance of a license, with a required bond, to distill spirits. Cost of commercial distillery permit? $250. See The Excise Act of Canada Chapter 571, Section 2 (Schedule). Location of commercial distillery permit application online? The Application process is through the Canadian Minister of National Revenue and the Application itself and related documents must be obtained through that office. Is a fuel alcohol permit available? No. Ethanol and alternative fuel production is allowed and encouraged, but no specific License or Permit is required. Permits that may be required, depending on the location, size and circumstances, include water discharge, wastewater and air quality. The Ministry of Agriculture does not have a specific Permit to issue, but is probably the place to start the process. So off I’m understanding correctly, if one wants to own a still, the best and cheapest way to do so would be to get a fuel alcohol permit? If your State allows fuel alcohol permits this would make it legal for you to own a still and make fuel alcohol.